The port of Ísafjörður is the largest of all harbours located in the Westfjords region of Iceland. Fishing has traditionally been — and remains — the area’s main source of income. Ísafjörður is Iceland’s third busiest port of call for cruise ships. Calling vessels make a dramatic journey up the Ísafjarðardjúp Bay which shelters a number of smaller fjords. Ísafjörður town is located in one of these, the Skutulsfjörður. 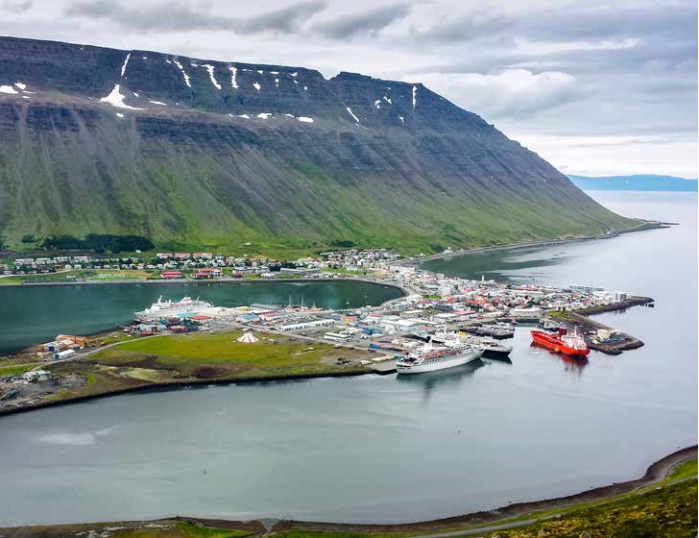 Flanked on three sides by towering mountains, Ísafjörður is a near-perfect natural harbour. Close to the cruise quays is the Maritime Museum, located in one of the oldest houses in Ísafjörður, which traces the life and history of the settlement with a fascinating array of fishing gear and a variety of boats. The oldest group of houses in Iceland is also here, merchant properties dating back to the 18th century. 15 minutes away by bus is Ósvör, a reconstructed fisherman’s hut made out of stone and mud. Ísafjörður has much to offer and is a wonderful place to visit in the summer when the nights are light. Visitors will find a variety of local handicraft, activities, art and a special atmosphere in this great place situated just below the Arctic Circle. Local attractions include the remote Hornstrandir nature reserve. Covering 600 km2 it offers a paradise without equal for hikers and nature lovers. No roads, just plenty of wild flowers, birds and natural beauty. A popular excursion is a boat tour to the island of Vigur, 30 minutes from Ísafjörður and home to a large eider duck colony of around 3,500 nests that generate 60 kg of eiderdown a year. Puffins, black guillemots and Arctic terns make up some of the vast bird population that make this magical island worth seeing. Right in the town centre, just a few minutes’ walk from where you disembark, you will find the Old Town, with its narrow streets and wooden 19th century houses. Strolling further up along the main street you will soon come to the new church with its famous altar piece “The Birds of the Sky”. Next to the church you will find our culture house, the Old Hospital, which offers various exhibitions throughout the year. From the Old Hospital, there is just a short walk to the public garden Jónsgarður, the home of the Whale Bone Arch, a structure that is five meters high and made from the jaws of a blue whale, the largest living mammal on planet Earth. If you prefer a guided Ísafjörður walk, please seek assistance at the tourist information office. Dynjandi is one of Iceland’s most majestic waterfalls. To access it, though, you would need to either rent a car or join a tour. Expect the tour to take up to five hours, especially if the weather is good and you want to spend some time hiking up along the waterfalls. The drive between Ísafjörður and Dynjandi also offers spectacular scenery. Ísafjörður is rich when it comes to good neighbours. We are surrounded by beautiful villages, which all have plenty to offer visitors. 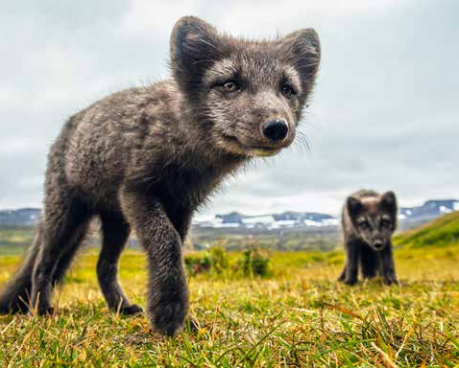 The Arctic Fox Centre, the Old Fisherman’s Hut, the Nonsense Museum, local food tasting, the Old Blacksmith’s Workshop, beautiful walks and unspoiled nature. To visit our good neighbours you can either rent a car or join a guided tour. Ask for assistance at the tourist information office.